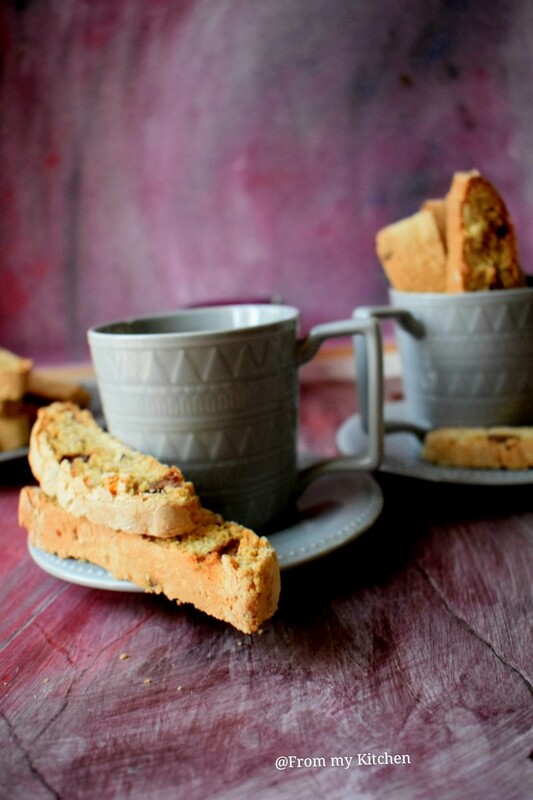 Biscottis are my ever favorite companion with tea. 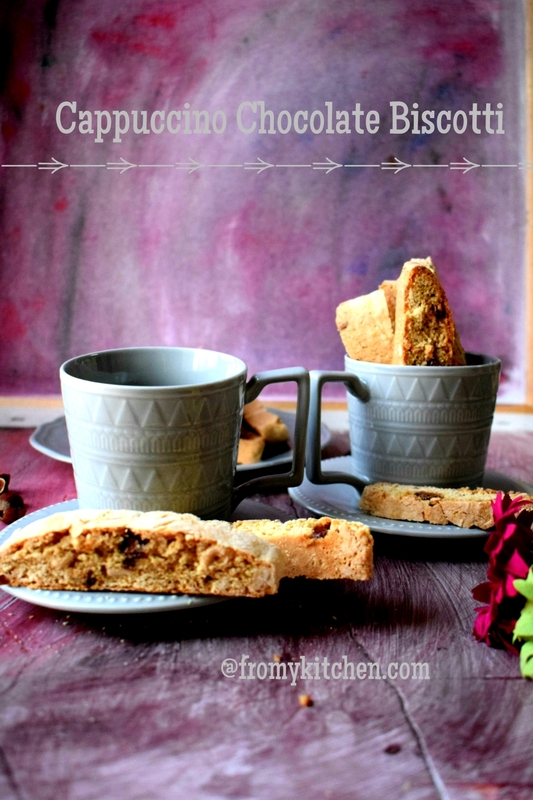 That crispy rustic cookie filled with nuts with a light sweetness in it is a piece of heaven while dipping in your coffee or tea! 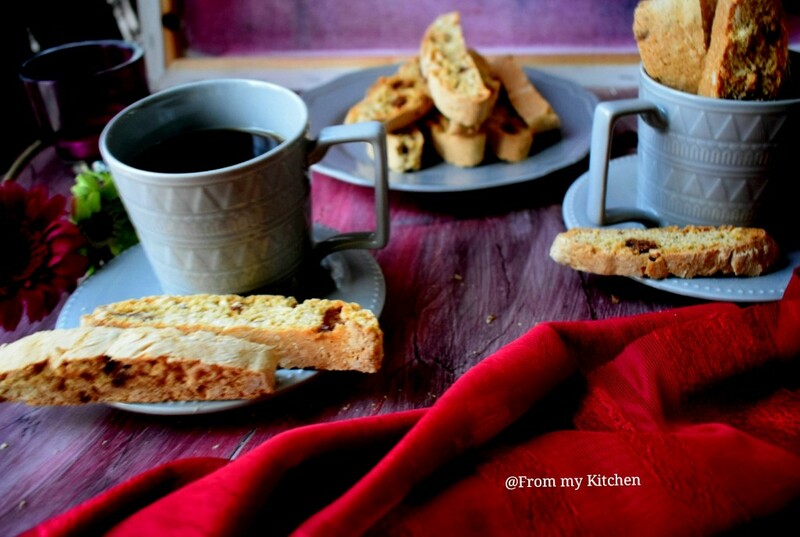 Yes, I already have two biscotti recipe on the blog Almond Biscotti and Chocolate Pistachio Biscotti. 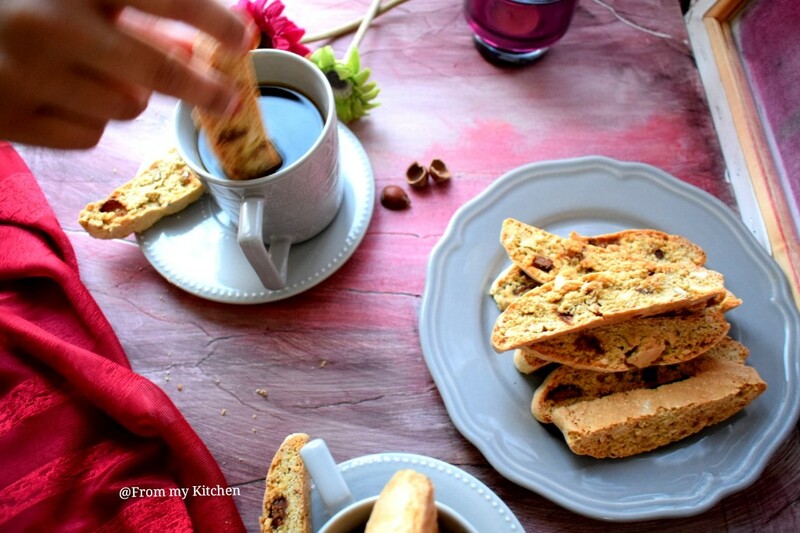 This one is a coffee and cinnamon flavored biscotti with hazelnut and chocolates in every single bite. Should i say any more?? Its surely a crowd pleaser among the kids and adults! 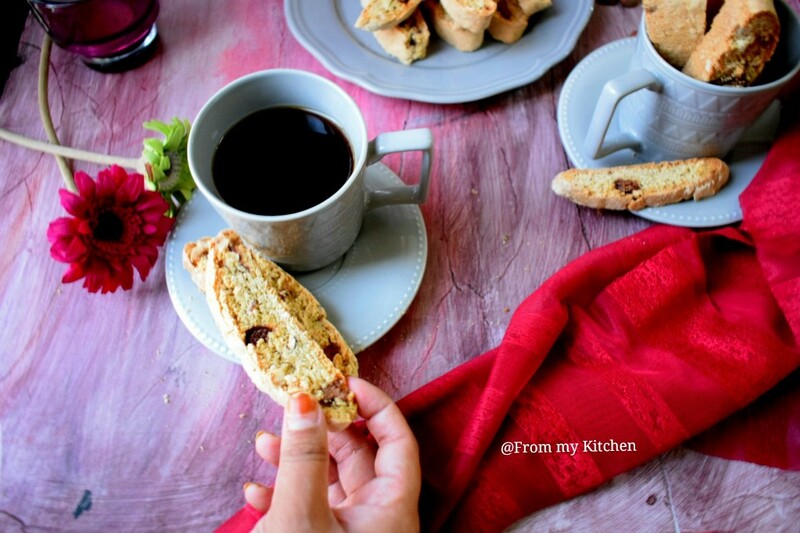 Like other cookies, biscotti doesn’t contain much fats like butter or oil, so u can have it without any guilt! We just loved the flavor combination here! 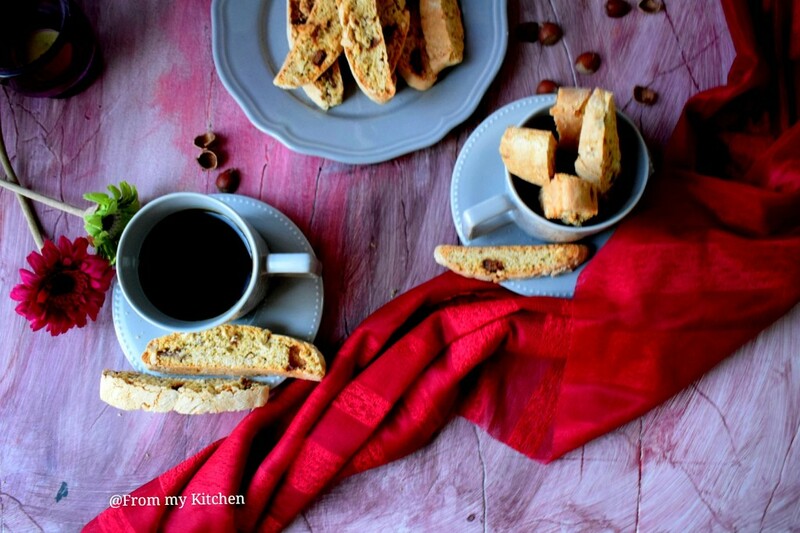 Perfect flavor of coffee cinnamon along with that hazelnut and chocolate chunks is like you have to try it for sure! My biscotti dabba wiped clean within 2 days!heeh! 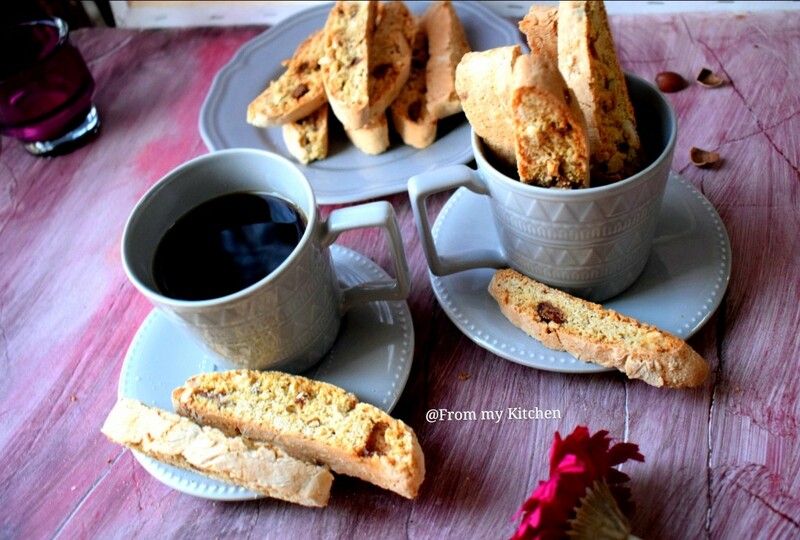 Biscotti’s dry, crisp and crunchy texture comes from baking the cookies twice. The first baking sets the dough, while the second baking dries it out. When you have nothing to munch on with tea or coffee make a batch of this and relish it with your tea! In a small bowl whisk together espresso (coffee), milk, egg and vanilla extract. In another large bowl mix together flour, sugar, baking soda, baking powder, salt, and spices until combined. Add the espresso mixture and mix until a dough forms. If the dough is sticky add two or 3 tbsp flour and knead it with light hands. On a lightly floured surface divide the dough to 2 equal portions roll each half of dough into a log(check the video). Transfer the logs to a parchment paper lined baking sheet, spacing about 4 inches apart. On a cutting board cut the logs crosswise on the diagonal into 3/4 inch slices. Arrange the slices on the baking sheet, and bake for 5 – 8 minutes on each side, or until they are firm and pale golden. Remove from oven and place on a wire rack to cool. Store in an airtight container.